Deep enough for relaxing soaks yet occupying a small footprint, the Melody 5 ft. Centre Drain Soaking Tub in White is a superb choice for undersized bathrooms or confined spaces. Contemporary styling and clean lines contribute to the freestanding bathtub's modern aesthetic, sure to enrich your bathroom ambience and add a hint of serenity. The acrylic construction is strong, light and warmer to the touch than typical steel or enamel tubs, allowing for easy installs and heat-retaining soaks. It's surrounded by a flat ledge to keep candles, oils, salts and other bath accessories nearby. Chrome-finished overflow and drain outlets are included to give this elegant bathtub a polished look. The Hannah 4.92 ft. Back Drain Soaking Tub in White is inspired by the hard edges and lines of modern architecture. Clean and geometric, the asymmetrical shape lends a beautiful minimalist, yet updated, feel to the modern bathroom. Contemporary styling and crisp angles contribute to the freestanding bathtub's refined look, sure to enrich your powder room ambience and add a hint of sophistication. The acrylic construction is strong, light and warmer to the touch than typical enamel or steel tubs, allowing for easy installs and heat-retaining soaks. Chrome-finished overflow and drain outlets are included for a polished look. Create a luxurious centrepiece for your bathing area with the Maryam freestanding bathtub. Made for deep soaking and relaxation, the ergonomic design provides lumbar support at both ends, so you can stretch out in full comfort. With its crisp, clean lines and elegant profile, this versatile bath complements a wide range of bathroom styles and offers easy installation. A natural for showcasing a beautiful modern bathroom. Soft rounded design meets full immersion soaking in the Melissa 5 ft. Centre Drain Soaking Tub in White. Light yet strong acrylic construction aids in ease of installation and is warmer to the touch than your average enamel or steel tubs. High flow drain allows for fast and convenient drainage. Melody 59.5-inch Acrylic Flatbottom Centre Drain Soaking Tub in White Deep enough for relaxing soaks yet occupying a small footprint, the Melody 5 ft. Centre Drain Soaking Tub in White is a superb choice for undersized bathrooms or confined spaces. Contemporary styling and clean lines contribute to the freestanding bathtub's modern aesthetic, sure to enrich your bathroom ambience and add a hint of serenity. The acrylic construction is strong, light and warmer to the touch than typical steel or enamel tubs, allowing for easy installs and heat-retaining soaks. It's surrounded by a flat ledge to keep candles, oils, salts and other bath accessories nearby. Chrome-finished overflow and drain outlets are included to give this elegant bathtub a polished look. 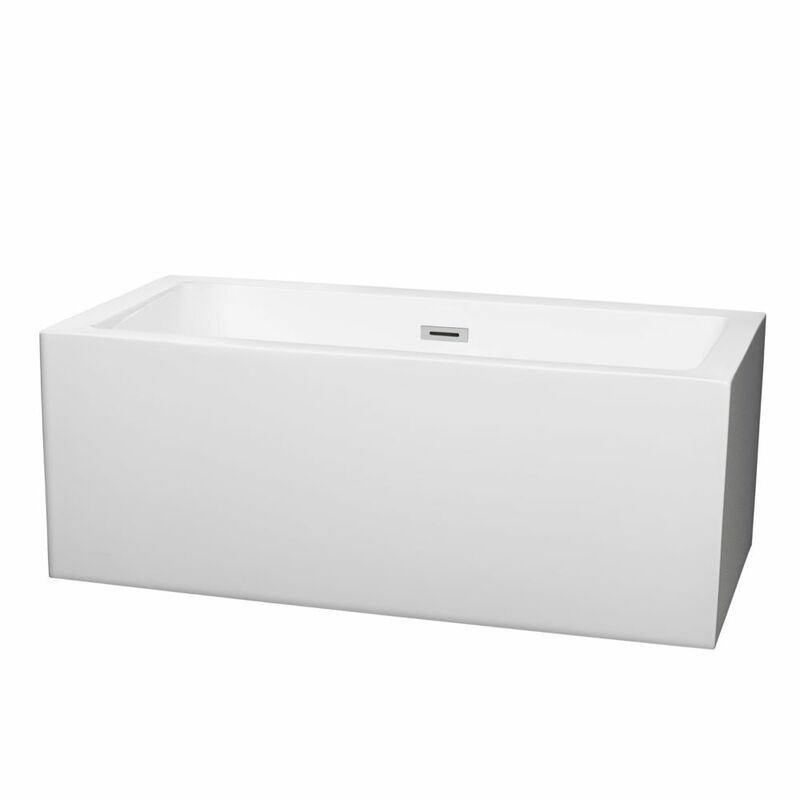 Melody 59.5-inch Acrylic Flatbottom Centre Drain Soaking Tub in White is rated 5.0 out of 5 by 1. Rated 5 out of 5 by David from THIS TUBE IS EXACTLY WHAT WE WERE LOOKING FOR.... THIS TUBE IS EXACTLY WHAT WE WERE LOOKING FOR.